Back support provides excellent support and compression for lower back and abdominal pain. 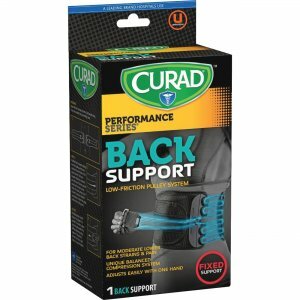 Back support is great for use with pulled muscles, sprains, strains and consumers with limited strength and mobility. Mechanical advantage pulley system features a low-friction design for smooth effortless compression. Single pull system allows one-handed adjustment. Breathable, lightweight fabric is latex-free and provides all-day comfort. Rigid posterior panels provide support and are designed to prevent the belt from rolling.